One of the hardest things about doing any kind of research into the history of dog breeds is keeping all the breed and type names straight. Here’s one that confused me for years: Alpine mastiff. Most of us have been taught somewhere that the term “Alpine mastiff” means St. Bernard, but actually, it refers to a livestock guardian breed from the Italian Alps that also ranged into Switzerland. 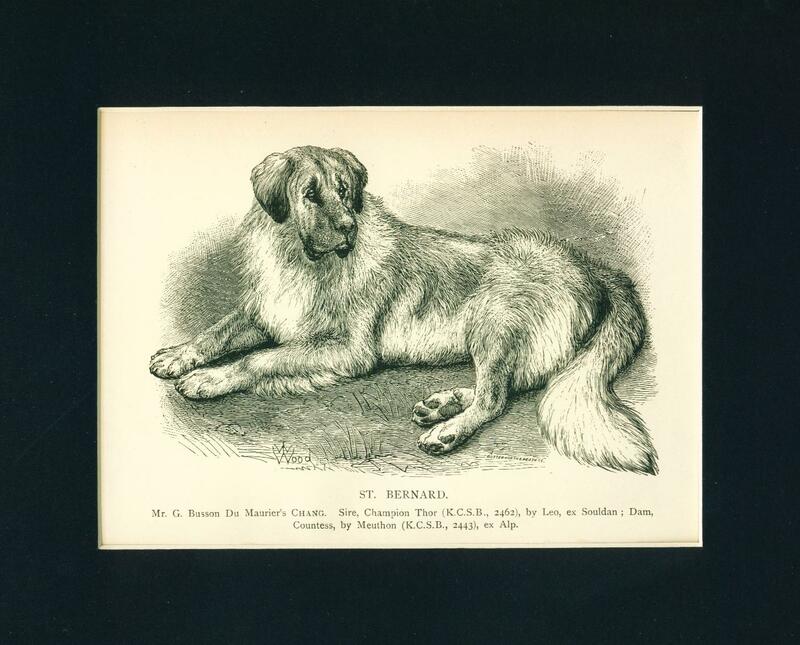 It may be an ancestor of the St. Bernard breed, because one of these dogs was actually imported to England in 1829 directly from the St. Bernard Hospice. The dogs at the hospice were mostly of the sennenhund type– essentially red sable and brindle variants of the progenitors of the Bernese and Greater Swiss mountain dogs. These dogs were big, but they certainly were not giants. (The famed Alpine rescue dog named Barry was in the 85-95 pound range). It may have been from these animals that we Anglo-Saxons got the idea that St. Bernards were giant dogs. The Alpine mastiff also played a role in developing the modern English mastiff breed, which is also famed for its vast size. 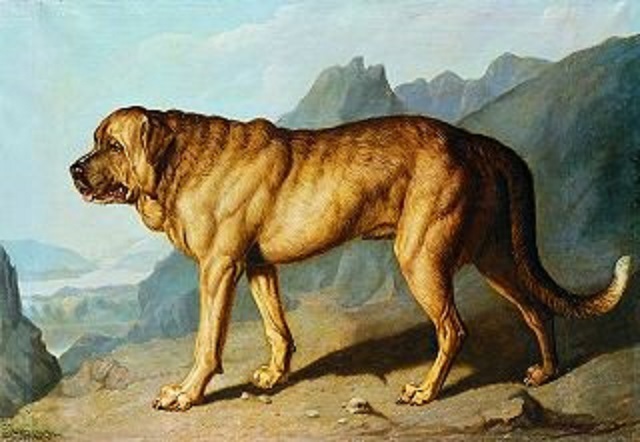 The most famous image of an Alpine mastiff is of “Lion,” an Alpine mastiff exhibited at the Spring Gardens in 1817. The dog was brought from the St. Bernard Hospice and eventually wound up in the hands of a Mrs. L.W. Boode. 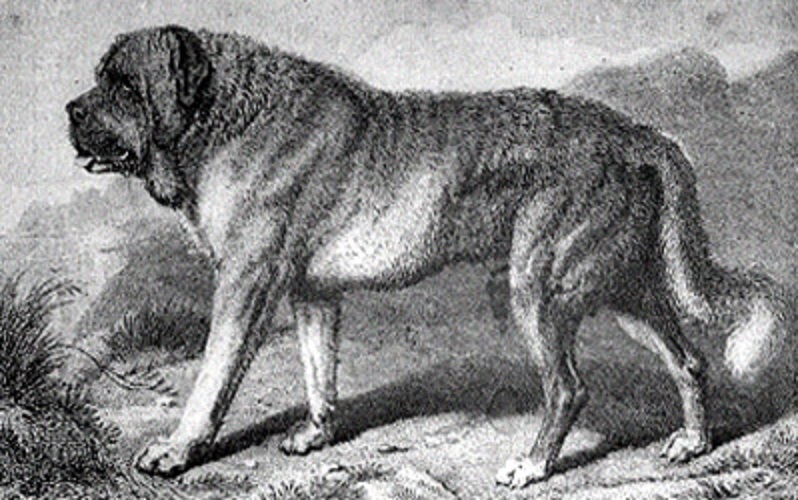 At the time, he was believed to be the largest dog in England, and when Sir Edwin Landseer encountered him, he had to do portrait. This breed is likely the origin for the common fawn coloration in English mastiffs, which actually came in many more colors before they became standardized. But one thing is pretty clear: the Alpine mastiff was not the same breed as the St. Bernard. Over time, though, we’ve merged the terms. The modern St. Bernard is probably derived from it, but when one looks at the images of the actual working dogs at the hospice, they were not breeding giant mastiffs. Of course, once these giant dogs became known in England, it wasn’t long before they came to expect every dog from the St. Bernard Hospice to be a behemoth. And now the modern mostly sennenhund-derived St. Bernard is suffering the health consequences of being bred to look like an Alpine masitff. I should note that there is no genetic evidence showing a relationship between St. Bernards and English mastiffs, but it is well-documented that “Alpine mastiffs” played a role in developing the modern English mastiff. So maybe the Alpine mastiff played no role in developing the St. Bernard. Which is really a bizarre idea to consider. Yet the Alpine Mastiff seem closer to Spanish Mastiffs then St.Bernards. In the early days of the dog fancy, when the rich of Europe and America were jaunting about looking for dogs to outbest their other rich friends with, I doubt many of the “St Bernards” that made it to England were that closely related to the red and white cowherd’s dogs the modern Saints are descended from. Here’s a quote from a book on TMs by Swiss author Max Siber from 1897. Then there is a photo of Chang, a grandson of Menthon. His head reminds me of both Lion and a Tibetan Mastiff. Also note that he appears to be Swiss born and bred. I wonder how much of those early showring St Bernard’s DNA found it’s way into to modern show St Bernard bloodlines? p.s. That “that closely related” should have been “as closely related”. How likely is it that mastiffs of this type were involved in creating the ‘large Newfoundland’ as well as the St Bernard? Hola, ¿Este perro guarda alguna relación con el “Alpes Spaniel?. ¿Existió realmente el “Alpes Spaniel?